Gold not allowed to close the week above $1,350. My latest article on the Sharps Pixley website looks at gold’s performance over the past week with it affected positively and negatively by conflicting statements on U.S. policy on the dollar at the World Economic Forum in Davos, but culminating in gold being held marginally below the psychologically important $1,350 level at the week’s end through activity in the gold futures and currency markets. With potentially conflicting comments re. the weakness of otherwise of The U.S. dollar from U.S. Treasury Secretary Steve Mnuchin and President Trump, the gold market didn’t know which way to run. Mnuchin had to backtrack, but not particularly convincingly, on his weaker dollar being beneficial to the U.S. economy statement lest he be accused of talking the dollar down in conflict with U.S. assurances that it would not do so. President Trump’s Davos statement suggested he was in favour of a stronger dollar, contrary to his earlier position on the currency, and following this the dollar rose, and gold fell on Thursday. But then the former reverted to lower levels in Friday afternoon trade in the U.S. and gold rose back above $1,350 before activity in the futures markets and gentle dollar support brought gold back to heel and the yellow metal ended the week a fraction under the key $1,350 level. To an impartial (relatively) external observer of the market the gold price did appear to be trying to rebound back above $1,350 but kept being knocked back again. Whether it can build sufficient momentum to breach the $1,350 level permanently next week remains to be seen, but one suspects it will do so barring any major adverse news or data. So far this year precious metals have all done well as Nick Laird’s bar chart from www.goldchartsrus.com shows (below). The bar chart shows the relative performances of the four major precious metals, the HUI (the NYSE ARCA Gold Bugs index) and Nick’s Silver 7 index tracking seven major silver stocks and the stock indices have generally outperformed the metals which are their key drivers. As can be seen platinum is by far the best performer year to date, but all have done pretty well given the year is only just over 3 weeks old. We suspect that Silver and the Silver 7 Index will ultimately outperform the others – however we would have said that in 2017 too – and ever-unpredictable silver ended the year as performing far more poorly than gold, and particularly palladium which was far and away one of the best assets of any type to hold last year. As readers of my writings here will know I am anticipating precious metals to do well this year – except perhaps palladium which may have risen too far too fast in 2017. 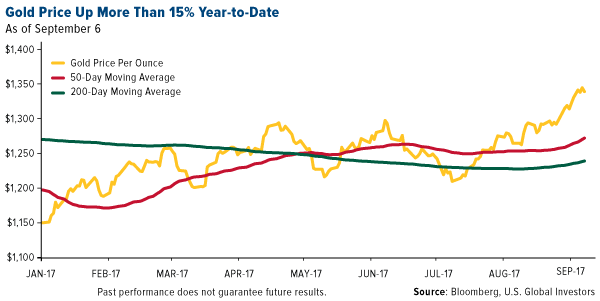 But I don’t anticipate any of them doing spectacularly well with rises pretty much in line with gold’s 2017 performance (See:Precious metals price predictions for 2018 – gold, silver, pgms) , but this year stocks may comfortably well outperform the metals assuming the general trajectory for both is upwards. The key may well be dollar strength and if the Trump Administration sees exports picking up, and imports falling, due to a weaker dollar, then the engineered decline in the dollar index may be allowed, or even encouraged, to continue. This process may well be mitigated though by similar effective currency devaluations among competitor nations or areas as others seek to contain any competitive disadvantage with their own export businesses. Falling dollar, rising gold – where will that take us? Here’s my latest article published on the Sharps Pixley website earlier today looking at the collapsing US Dollar and its impact on the gold price. While gold is very definitely sharply higher in dollars, the fall in the dollar index means that in some other significant currencies – notably the British pound which finds itself at its highest level against the dollar since the Brexit vote a year and a half ago – the gold price may actually have fallen. If gold trading this morning in Europe is anything to go by, gold is headed for US$1,350 an ounce, and not before time. But before non-U.S. gold-owning citizens get carried away with euphoria they should also be aware that the dollar index has dropped below 90 for the first time since early 2014 and the gold price in many other key currencies like the British pound (easily at its highest level against the dollar since the Brexit vote) the Swiss Franc and the Japanese yen, has actually fallen. Silver though has been somewhat left behind with the Gold:Silver Ratio at well over 78, but we do anticipate, if gold stays in the high $1,340s, or breaks through $1,350, that silver will play catch-up. It usually outperforms gold when the latter is rising sharply. The performance of the dollar gold price level, though, does suggest that the big money into the gold futures markets, which had been successful in keeping the shiny yellow metal price down below $1,340, may be losing control. It could thus see discretion as the better part of valour and allow gold to find a new top and then work hard again to keep it there. The key though looks to be U.S. dollar strength and it remains to be seen whether the recent decline is an engineered one in an attempt to make U.S.-manufactured goods more competitive (a policy that had had been signalled by President Trump some time back – although since denied). If so a dollar decline may have gained more steam than intended, as these things do. On the face of things the U.S. economy is in a decent growth stage, unemployment is at a low level – both things that might normally lead to dollar strength, not weakness. But perhaps massaged government-produced statistics are beginning to be doubted and the huge U.S. debt level is beginning to come home to roost as some countries seemingly (reportedly) are beginning to reduce their reliance on dollar denominated securities in their foreign exchange holdings. Perhaps the Trump Presidency is not making America great again – at least in terms of dollar dominance of global financial markets – but having the opposite effect globally. Could all this herald the start of the much predicted crash. 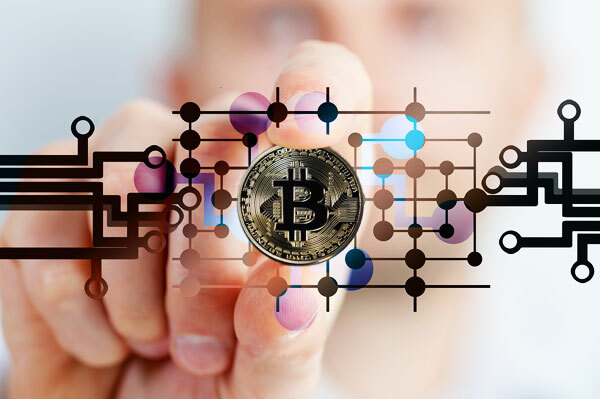 Stock markets appear to be stalling, bitcoin has come off nearly 50% from its peak – maybe the speculators and wealth protectors are at last beginning to see gold as an answer. It’s probably too early to tell yet, but signs don’t augur well for the seemingly unending bull markets in equities we have been seeing in the past few years. Market growth is all about confidence. Once that starts getting eroded it can turn into a desperate downwards spiral. The problem of course for gold is that, should markets collapse, it too could suffer collateral damage as institutions and funds struggle for liquidity and have to sell good assets to stay afloat. We saw this in 2008 in the last big stock market collapse, but the comfort for gold holders, perhaps, is that gold was far faster to recover than equities and went on to perhaps its strongest bull market ever taking the price up to around $1,900-plus over three and a half years, nearly tripling its price from its October 2008 nadir. As I write the spot gold price has indeed briefly hit the $1,350 level. Whether the U.S. market will allow it to stay there when it opens in just over 3 hours time remains to be seen. Mike Gleason* of Money Metals Exchange interviews Michael Pento. Below is a transcript. However the interview is also available on a YouTube video and if you’d prefer to watch the video here’s a link to it: https://www.youtube.com/watch?v=3QKushYDGH0. The interview was recorded before North Korea conducted its H-Bomb test on Sunday and gold has moved up a few notches as a result, but that does not detract from Michael Pento’s overall message – it perhaps brings the timing scenario forwards. Mike Gleason: It is my privilege to welcome in Michael Pento, President and founder of Pento Portfolio Strategies, and author of the book, The Coming Bond Market Collapse: How to Survive the Demise of the U.S. Debt Market. Michael is a well-known and successful money manager, and has been a regular guest on CNBC, Bloomberg, Fox Business News, and also the Money Medals Podcast, and shares his astute insights on markets and geopolitics from the perspective of an Austrian school economist viewpoint. It’s always a real pleasure to have him on with us. Michael, welcome back and how are you? Michael Pento: I’m doing fine and thank you for having me back on Mike. Mike Gleason: Well Michael, let’s start out here with the topic that is dominating the news. Hurricane Harvey has laid waste to Houston, and the Texas Gulf coast. But Wall Street doesn’t seem to be bothered. Gold and silver have got a bit of a boost, but the equity market shrugged it off. This all makes me think back of the parable of the broken window, which was introduced by the well-known 19th century economist, Frédéric Bastiat, where he described why the money spent to recover from destruction is not actually a benefit to society. But Michael, it appears as though Wall Street and the financial world might be buying into the idea of the broken window fallacy and viewing it as truth, and that all the destruction will somehow be good for the economy. What are your comments there, and what do you makes of the market’s initial response here, to this terrible, terrible tragedy? Michael Pento: I guess it’s part of the hyperbole and hysteria that encompasses Wall Street right now. Nothing can knock down the stock market. You didn’t even mention the fact that North Korea Kim Jung-un, his new regime, launched his 80th scud missile, and they’re ICBM’s, ballistic missiles, into the Sea of Japan and over Japan, and towards southern, south Sea of Japan. And nobody seems to care. As a matter of fact, the market rallied, from being down about 150 points in the pre-market to, I think, plus 58 on the DOW, yesterday (Tueday). There’s nothing (that) can harm this market. The reason for that … The simple reason behind that, is that central banks have printed 15 trillion dollars’ worth of confetti and counterfeit money, leading out of the financial crisis, from 2008 to today. 15 trillion and counting. You know, don’t forget you still have 60 billion euros per month, over in Europe, and you’ve got the Swiss Central Bank. You’ve got the Bank of Japan, which is hopefully enamored with money printing in it, at least Mr. Kuroda, the head of the BoJ, understands that he can never, never, even think about, or hint about reducing his quantitative easing, or QQE program that he has. Going back to Frédéric Bastiat … Wall Street, very low level of thinking, very idiotic group of individuals, who actually … I was listening to CNBC, comment about how … By the way my heart and my prayers go out to the people in Houston, and now in Louisiana. I heard a commentator on the show saying, “Hey, but let’s look at the good news here. Look at all the construction that’s going to happen, so this is actually a boom for the economy.” Well, you know, if you follow that philosophy, then we might as well just bulldoze all the houses, and all of the physical structures in the United States. That’s how you grow GDP. You don’t grow GDP through productivity, and you don’t grow GDP by increasing and boosting your labor force. The new way of growing productivity now, is to break things, and to pray for catastrophic storms. Of course, they never think about where the money comes from. In other words, if I was going to fix this pane of glass, in the analogy that you brought up, the broken window analogy … Well, I was going to buy a pair of shoes, and now I have to spend that money on fixing the pane of glass. Or, if I have to just borrow that money, that money that’s borrowed, to fix the glass, would have been borrowed to, perhaps buy capital goods, and expand the economy. And of course, if that money is just printed, well then, we have the scourge of inflation. There is no magic. There is no free lunch, in anything, and especially in economics. That’s true. Mike Gleason: When the flooding in Texas moves out of the news, the coming fight over the debt ceiling could be front and center. Now, it looked like, to us a fight was brewing with a contingent of conservative Republicans revolting on one flank, and Democrats looking to thwart Trump and his agenda, everywhere possible, on another. Trump and GOP leadership have their hands full, getting a bill to hike the borrowing limit passed. But it could be that Hurricane Harvey will be used to prevent a big fight here, relief for Texas, might be inserted into the bill to raise the borrowing cap. And few politicians will object for fear of being criticized. With that said, are you expecting a fight over the debt ceiling to be significant Michael? And any chance, we could see a government shut down here? Michael Pento: Well, at first glance, a prima facie look at this, is that I expect more dysfunction in DC. I predicted this when Donald Trump was elected. I said that his massive reform of healthcare, his tax reform packages would be both, deluded, and delayed, and that’s exactly what has happened. And of course, Wall Street likes to look at every event as a positive. The glass is always half full. So, now they’re saying that we have hurricane that we have to pay for, that this is going to somehow make the passage of everything, tax reform, construction spending, infrastructure, the debt ceiling, the budget. Everything’s going to go smoothly. I have my doubts. I run an actively managed portfolio. So, the base case scenario is dysfunction in DC. That has been very, very prudent, and a correct path to assume and to take. I believe it’s not going to go smoothly. I believe that we have to pass the budget by the end of September, and raise the debt ceiling by middle of October. Now, Mnuchin and Mulvaney, they were on opposite sides of this, but now they’re on the same talking points as Trump. They just want to raise the debt ceiling cleanly. But I don’t think the Tea Party Republicans, in the House of Representatives are going to go alone with that, so yes there will be a fight, even if they try to attach this hurricane spending bill, infrastructure bill to it. Mike Gleason: The U.S. dollar isn’t looking too good these days. We’ve seen pretty steady decline, since the beginning of the year. Of course, the dollar is a terribly flawed instrument, and the fact that the DXY index traded at an all-time high late last year, was more a testament to just how bad other major world currencies must be. Where do you think we’re going from here? Is the dollar going to head lower? Michael Pento: Well, we went from about 80 on the DXY … which is heavily weighted towards the euro … from 80 to above 100, in anticipation of what? Anticipation of Mr. Trump getting a lot of his agenda passed, rather quickly. And also the divergence between the two major central banks, between ECB and the Federal Reserve. And where, as we see now, things not shaking out that well at all. We see the dollar index has dropped from above 100, now at major support around 92. If it breaks through 92 on the DXY, I think it could head towards 80. All eyes are on the ECB. The ECB is primarily in charge here. If Mario Draghi, on September seventh, announces a tapering of his 60 billion per euro a month, asset purchase program, I would expect the euro to skyrocket, and the dollar to fall precipitately, right through that 92, towards 80. And, of course if he does not taper his asset purchase program, then the dollar could catch a bid and head back towards 100. That’s why, again, I run an actively managed portfolio, trying to guess the minds of these megalomaniac schizophrenics, that run central banks, is very, very difficult, so it’s best to have, not a passive ETF strategy, buy and hold, and then forget about your money. You have to actively manage your portfolio. So, I will react to, what Mario Draghi does. European GDP growth is not very strong, but getting stronger. They are missing on the inflation target, just as we are here in the United States, at least the way central banks measure inflation, if you don’t count everything that’s going up, like medical costs, and college tuition, and asset prices. So, who knows what they’re going to do, but you have to be reactive, rather than just proactive in this kind of environment. Mike Gleason: Staying on monetary policy here for a moment. Any thoughts on where Trump goes with his Fed chair appointee early next year? Any chance Yellen get reappointed, or does he bring in somebody even more dovish? What do you think? Michael Pento: Well, it’s hard to get someone more dovish than Janet Yellen, but … I guess, you know, I don’t have any special insight here. Gary Cohen would be my best guess, because Trump likes to put his fingerprint on everything, and he needs somebody in there who is going to really fight for low interest rates, and for deregulation policy. Yellen kind of submarines herself at Jackson Hole, talking about the importance of regulation in the banking system. So, my best guess is that, come February 2018, that we have a new Fed chair, and that person is Gary Cohen, who will really fight hard for low interest rates, and a weak dollar. Both those things espoused by our President Trump, not candidate Trump, President Trump, and there’s a difference. Mike Gleason: Yeah. Very important distinction there, for sure. Let’s dig into the gold and silver markets here for a minute. Now, demand in the retail bullion market continues to be pretty soft. To our way of thinking. That can be largely attributed to a few factors. First off, bullion investors are more optimistic about a Trump Presidency, than the Obama Presidency. Another is that, precious metals prices really haven’t been going anywhere for a while now. And then, also, those who have been buying gold and silver as a safe haven, have probably, just gotten exhausted. They’ve been on high alert, expecting significant fallout, resulting from ultra-loose Fed policy, massive Federal deficits, unlimited borrowing, et cetera. But the reckoning, it never seems to come, so are bullion investors just going to have to live a while longer here, in purgatory, or do you see anything exciting developing in the months ahead for the metals? Global growth is not anywhere near where it was in the early 2000’s. We’re about – globally speaking, you look at the major developed economies – they’re about one percent, one to two percent. There is no big expanse in global growth, but whatever global growth there is, it totally and completely hinges on continued low interest rates. And central banks have now convinced that they’ve solved all our problems, as I said. And now, you look at the Fed, who entered QE in 2014, and now we’re getting ready for quantitative tightening, reverse QE to start this year. And surely, I’m 100% convinced, if it doesn’t start in September, at least in the early part of 2018, Mario Draghi and the ECB, will start to taper, it’s assets. They were 80 billion. Now, they’re 60 billion. He’s going to be reducing his asset purchase program towards zero, certainly by the end of 2018. So, when that happens, you’re going to have … and the Fed likes to talk about tapering, they’re not selling assets, they’re just letting them roll off the balance sheet… assets do not roll off of a Fed’s balance sheet. When the Federal Reserve has a note due, what they’re going to do, is ask the treasury to pay them this note. Well, the treasury has no money. So, the treasury has to sell an amount equal to the note due to the Fed. The treasury then, has to not only sell this debt, but has to now, service this debt, whereas before those interest payments were being refunded by the Fed to the treasury. And when the Fed gets this money, it’s retired. So, you’re talking about a draining of the money supply. You’re talking about that happening, not only in the United States, but also in Europe. And who’s going to buy all this debt? 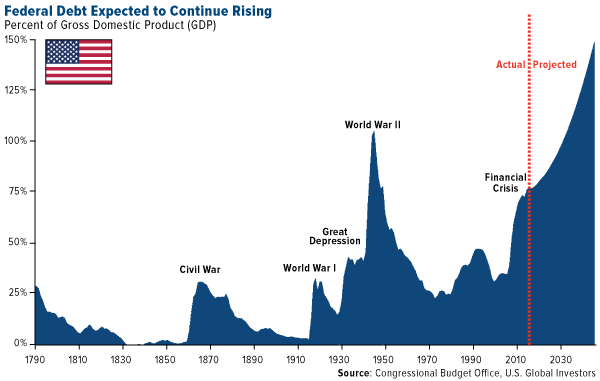 Now, the debt has absolutely, as I said, skyrocketed, 70 trillion dollars increase. There isn’t any private source for this funding. 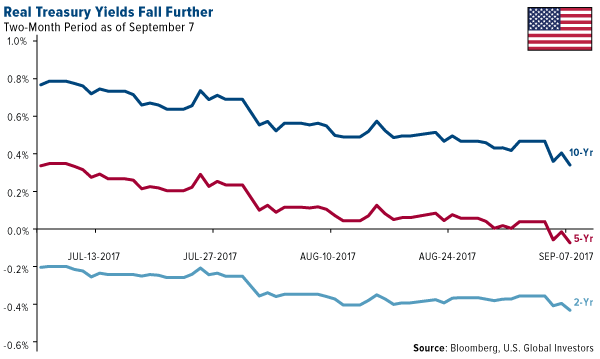 No one is going to buy a German bund, yielding .37%, when there is no central bank around, and the central bank is getting ready to sell assets. There isn’t anybody who’s going to buy a U.S. 10-year note, yielding 2.2%, or 2.15 as we make this recording. Nobody is going to make that purchase, when the Federal Reserve is getting ready to sell trillions of dollars. They have four and a half trillion dollar balance sheet. If they take it down to two and a half, it’s two trillion dollars’ worth of mortgage backed securities and treasuries that are going to be adding to that a trillion-dollar deficit that we already have. Deficits go up huge, as interests rates go up. Interest rates rise. It’s a very vicious, counterproductive cycle. If we have higher debt service costs for every one percent to 200 billion dollars. We have one trillion dollar in deficits, because of demographics. And if we have a recession, deficits will rise and buy an additional trillion dollars. We can have deficits well over two, approaching three trillion dollars, with no help from the government. This is going to cause, whatever relatively anemic economic growth to falter substantially. And I will add this. We already have the automotive sector, and the real estate sector rolling over in this country. If we have a spike in interest rates, which will emanate from the ECB, whenever they decide to start tapering assets, and the German Bund rises towards nominal GDP, which is close to three percent, actually above three percent. You go from .37% to over three percent, that’s going to drag up yields across the globe, and that’s when the situations really going to be extremely pernicious. And what’s going to happen then … now the gold market is already sniffing this out, by the way, as we breached $1,300 an ounce a couple of days ago … the gold market is sniffing out this: that central banks are going to have to get back into the QE programs, across the board. And when that happens, faith in fiat currencies – not just the dollar, all fiat currencies – is going to falter very dramatically. You see some of this, not only in the gold market, but you see this phenomenon in the cryptocurrency world. There is going to be a dramatic watershed, trench and drop in the faith of central bankers. That’s the biggest bubble of all. And when that pops, gold’s going to go back to its all-time high, and well surpassing that level too. So, look for $2,000 an ounce gold. It’s going to happen rather quickly. I think it’s going to happen within the next couple of years, and you already see the beginnings of that happening today. Mike Gleason: Well, we’ll leave it there. Fantastic stuff as always. Michael, it’s great to have you on, we respect your insights quite a bit. It’s excellent to have you join us every few months. Now, before we let you go, as we always do, please tell people, who want to both read and hear more of your wonderful market commentaries, and also learn about your firm, and how they could potentially become a client, if they want to do that. Please tell them, how they can find out more information. Michael Pento: Sure. You can email me directly, mpento@pentoport.com. My website is www.PentoPort.com. The office number here is 732-772-9500. Be glad to talk to you. Mike Gleason: Well, thanks again Michael. Enjoy the Labor Day weekend. We look forward to catching up with you again later this year. Take care, my friend. Michael Pento: Thanks again for having me back on Mike. Gold Today –New York closed at $1,293.80 yesterday after closing at $1,279.60 Monday. London opened at $1,292.65 today. – The $: € was slightly weaker at $1.1254 after yesterday’s $1.1246: €1. – The Dollar index was slightly weaker at 96.68 after yesterday’s 96.73. – The Yen was stronger at 109.30 after yesterday’s 109.52:$1. – The Yuan was stronger at 6.7931 after yesterday’s 6.7954: $1. – The Pound Sterling was slightly weaker at $1.2898 after yesterday’s $1.2904: £1. New York rose to the same level as Shanghai yesterday. Today, Shanghai is pausing at the same level. London opened at almost the same level as Shanghai. Once again we see all three centers with gold prices at the same level. This is only the second time this has happened. The first was in the last month. Silver Today –Silver closed at $17.69 yesterday after $17.57 at New York’s close Monday. LBMA price setting: The LBMA gold price was set this morning at $1,292.70 from yesterday’s $1,287.85. The gold price in the euro was set at €1,151.01 after yesterday’s €1,144.40. Ahead of the opening of New York the gold price was trading at $1,291.75 and in the euro at €1,150.37. At the same time, the silver price was trading at $17.67. British Elections happen tomorrow. With the discussions around the size of the conservative majority it appears to us that the result will not affect the gold price. With inflation falling in the E.U. problems in the banking sector [Banco Popular has just been taken over by Santander in Spain] Draghi, who has repeatedly said that policy makers must be convinced that inflation can rise toward 2% on its own, before removing monetary stimulus, is set to leave the current stimulus position in place through the rest of this year. This is positive for gold. As you can see above, the dollar index continues to slip to a point where, if it falls to the lower 95 levels, it enters a bear market. This is the main influence on the gold price, not the short term political news. But this does not simply mean a falling dollar, it points to disruption in the global monetary system as all the globe’s currencies will be affected. It points to the proximity of a move from a dollar hegemony system to a multi-currency system. Within these changes lies a growing relevance of gold. The environment globally, continues to be positive for gold. Gold ETFs – Yesterday, saw purchases of 4.61 tonnes of gold into the SPDR gold ETF, but no change in the holdings of the Gold Trust. Their holdings are now at 855.163 tonnes and, at 205 tonnes respectively. Since January 6th 2017 48.369 tonnes have been added to the SPDR gold ETF and the Gold Trust. Will Gold and Silver Pull Back or March Ahead? Gold prices are up more than 11% since bottoming last December. 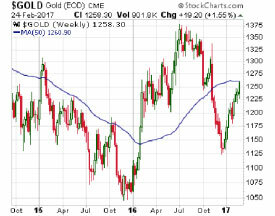 Their gains last week took the gold market right up to its 50-week moving average. In 2015, attempted rallies reversed at the 50-week moving average. 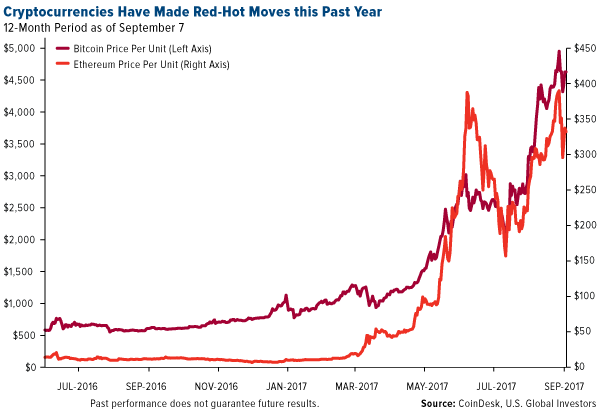 Could this level once again serve as a barrier to further price advances? Either way, long-term gold bulls shouldn’t sweat this particular technical level. Major bull markets need to pull back and reconsolidate periodically. Whether that starts happening this week, or later on at higher price levels, a downturn of some magnitude is inevitable. One indicator that may be pointing toward a pullback sooner rather than later is the negative divergence in gold mining stocks which are often leading indicators for the yellow metal. Despite gold spot prices rallying along with the broader U.S. equity market last week, the HUI Gold BUGS (Basket of Unhedged Gold Stocks) Index fell by 3.8%. That suggests that some big institutional speculators are turning bearish on gold near term. If you’re looking to accumulate bullion, a pullback should be welcomed as an opportunity to get in at lower levels. Long-term bulls will not want to see anything as severe as the drawdown that occurred in the second half of 2016, however. They will be looking for any coming correction to bottom out above the $1,125/oz low hit in December. Higher highs and higher lows characterize a major bull market. The December 2016 low was a higher low than the one from 2015. A higher high will occur when gold prices can move above $1,375. At that point, the public might start taking notice of precious metals markets – which so far this year have been overshadowed by the series of record highs in the U.S. stock market. President Donald Trump has taken credit for the rally in stocks. His vows to cut taxes and regulations have, no doubt, driven buying by investors. Trump also wants a weaker dollar to help boost U.S. manufacturing. That could put him in conflict with the Janet Yellen Fed if it moves to raise interest rates. Trump will have the opportunity to appoint multiple new members to the Federal Reserve Board. It’s one of the reasons why top financial and geopolitical analyst Jim Rickards is so bullish on gold. Gold Today –New York closed at $1,187.20 on the 10th January after closing at $1,182.50 on the 9th January. London opened again at $1,190.40 today. – The $: € was stronger at $1.0554: €1 from $1.0611: €1 yesterday. – The Dollar index was stronger at 102.09 from 101.66 yesterday. – The Yen was weaker at 116.05: $1 from yesterday’s 115.40 against the dollar. – The Yuan was stronger at 6.9225: $1, from 6.9244: $1, yesterday. – The Pound Sterling was slightly stronger at $1.2156: £1 from yesterday’s $1.2150: £1. If Shanghai is leading the way for the gold price, we would expect London and New York to rise too. Consequently, the gold price needs to move to $1,200 for it to be in line with Shanghai now. Shanghai on Tuesday was $13 higher than the close of New York. This morning London opened only $10.59 lower than yesterday’s Shanghai closing. And this strength in gold is happening while the dollar is rising and the Yuan slipping slightly. Meanwhile the People’s Bank of China has reported a fall in its gold reserves of in December by 20.98 tonnes. Is this a change in direction of the PBoC? We don’t accept that for a second. The Chinese authorities are rarely clear on such subjects and often don’t give a full picture of their situation, as it is not in their interests to do so. So this figure could be some sort of window dressing for our benefit. We know they use two agencies to hold gold on their behalf until it suits them to take the gold into reserves. They could easily have handed it back to the non-reporting one on a temporary basis. What we do know is that it is illegal to export gold from China. We also know that the SGE itself can hold gold and does not disclose it. LBMA price setting: The LBMA gold price setting was at $1,187.55 this morning against yesterday’s $1,183.20. The gold price in the euro was set higher at €1,128.31 after Friday’s €1,117.60 as the dollar strengthened. Ahead of the opening of New York the gold price was trading at $1,188.15 and in the euro at €1,131.46. At the same time, the silver price was trading at $16.77. Silver Today –Silver closed at $16.79 at New York’s close yesterday from $16.57 on the 9th January. We decided to look at the gold market through the eyes of a non-professional at the gold market. It quickly became clear just how easy it was to be informed in a way that distorted the true picture and confuse investors. For instance, when you hear that gold rose x% in sterling or y% in the dollar, that ignores the fact that the gold market is a global market where prices reflect the global market demand and supply eventually. We would prefer to see, “the dollar fell against gold, or sterling fell against gold”, a reflection of currency performance, not gold’s performance. As you have read in these reports the gold price is rising in all currencies at the moment, with both London and New York trying to catch up to Shanghai prices. New York and London have not moved up because of what Prime Minister May said, but that gold prices in sterling rose because of the pound’s fall. No event in the U.S. has caused gold to move up this week. It has moved up because of global demand and supply factors. In China demand for gold is robust. In the U.S. there was a very big sale [nearly 9 tonnes] of gold in one day earlier this week, so if the gold price was driven by U.S. factors alone, the gold price would have fallen. It didn’t, it rose! After all gold is a currency, it is both an asset and cash, globally. Relevant factors to the global gold price must not be local factors, unless they globally affect the gold price. Most that are attributed to moving the gold price just aren’t. That’s why understanding just where gold’s pricing power lies is so important. That’s why understanding currencies is so critical to understanding the gold price. Gold ETFs – Yesterday, in New York, there were no sales from the SPDR gold ETF or any from the Gold Trust, leaving their respective holdings at 804.996 tonnes and 198.30 tonnes. As we said in an earlier report, “Substantial sales of gold on a daily basis are needed for New York to control the gold price”. Did sentiment for gold change with the New Year? Gold Today –New York closed at $1,159.50 on the 3rd January after closing at $1,151.70 on the 30th December. London opened again at $1,166.30 today. – The $: € was weaker at $1.0441: €1 from $1.0310: €1 yesterday. – The Dollar index was weaker at 102.98 from 103.09 yesterday. – The Yen was stronger at 117.56: $1 from yesterday’s 117.92 against the dollar. – The Yuan was stronger at 6.9321: $1, from 6.9566: $1, yesterday. – The Pound Sterling was slightly weaker at $1.2270: £1 from yesterday’s $1.2280: £1. As you can see from the above figures [yesterday’s not today’s, as today are only released tomorrow] the discount to Shanghai’s prices is narrowing. Shanghai prices continue to rise showing good demand, but London and New York’s prices are rising faster, despite strong sales from gold ETFs. Against New York’s prices Shanghai was trading $16.38 higher, but against London Shanghai was trading only $10.40 higher. The change in sentiment in the global gold markets is now evidenced by these rising prices. LBMA price setting: The LBMA gold price setting was at $1,165.90 this morning against yesterday’s $1,148.65. The gold price in the euro was set higher at €1,117.51 after yesterday’s €1,106.01. Silver Today –Silver closed at $16.29 at New York’s close yesterday from $16.21 on the 30th December. With a weaker dollar today, gold has jumped in the dollar but even more so in the euro. But what is remarkable is that there was a huge sale of gold from the SPDR gold ETF, which did not move the gold price down. Instead the gold price rose and more so than appeared justified by the fall in the dollar. We can attribute this to the ongoing pull of Chinese prices and demand in Shanghai. The fact that gold prices went higher in London tells us that the gold sold from the SPDR gold ETF was not sold into London this morning, indicating it is on its way to Shanghai. It does look like gold prices are no longer headed lower so we do expect a more vigorous response in the gold price as the market is overhung with huge short positions in the Futures and Options markets. Any return of U.S. buyers of the shares in the SPDR gold ETF will act as an accelerant to this rise. Gold ETFs – Yesterday in New York, there were sales of 8.299 tonnes from the SPDR gold ETF but no change in the holdings of the Gold Trust, leaving their respective holdings at 813.871 tonnes and 196.20 tonnes. This was a significant tonnage unloaded onto the market and should have knocked the price down. As the Custodian HSBC is the one who either takes this amount onto its books, or usually sells it into London, we did not see any impact on London’s prices. Since January 4th this year, 209.601 tonnes of gold has been added to the SPDR gold ETF and to the Gold Trust. We are almost at half the level accumulated in 2016. Few seem to have commented on what appears to be an increasing trend towards large anomalies appearing between the Shanghai and London gold benchmark prices. Up until the beginning of November prices were pretty much in sync give or take a few dollars – a variation based on trading activity during the day, and, in some cases due to a difference between the gold tenor quality required under the two systems. The SGE specification is for 99.99% gold content or better, while London works to LBMA Good Delivery specifications where the requirement is only 99.5%. But on one ounce of gold this should only make for a maximum difference in price of around $5-6 at around a $1200 gold spot price. But recently – as the table below comparing SGE and LBMA (London) PM price benchmarks for the past month makes very obvious the price difference – virtually always strongly in favour of the SGE benchmark since early in the month. This has been consistently $10-20 or more (often $20-30) – even rising as high as $46 on November 23rd, although a significant part of this difference on that day was due to the sharp intra-day fall in the London gold price, (as noted in the introductory paragraph above) as will also have been the case on November 9th when there was a somewhat similar $45 difference. Note that this morning the Shanghai set benchmark price at $1,197.17 was around $24 higher than the prevailing spot gold price on the international market at the same time! As we pointed out here yesterday a part of the reasoning behind the higher SGE benchmark price levels is something of a squeeze on Chinese gold supply which is local market specific – particularly now that gold traders and fabricators may be looking to build stocks ahead of anticipated additional demand from the Chinese New Year holiday, and a reported reduction in gold import quotas by the Chinese Government to curb capital outflows. But part may also be due to Shanghai looking to establish itself as the true gold price setting exchange and thus usurping the still dominant position of COMEX and the LBMA. As China is the world’s biggest physical gold market, while COMEX and London are largely paper markets, it is probably only a matter of time before this comes to pass but for the moment the Western markets look to still be calling the tune as far as the accepted global gold price is concerned despite some hugely anomalous movements from time to time which many observers put down to manipulation. The latest such was only yesterday when a rise in U.S. jobless claims, which might normally be considered gold positive, saw the price marked down sharply after an initial small rise.